Press Touwei with the middle fingers turning inward and outward nine times respectively. Then perform point respiration. Then press Fengchi, turning inward and outward nine times respectively, and perform point respiration again. Then lower the hands to the Dantian along the anterior part of the cheeks. (Figs. Rub the sides of the nose with both middle fingers from up to down six times and then massage Yingxiang outward and inward nine times respectively. Perform point respiration. Then slip the fingers along the corners of the mouth to Chengjiang. 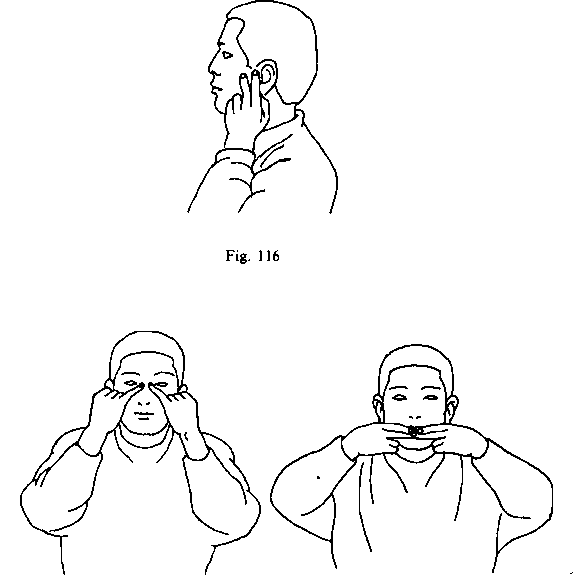 Press the index fingers on Chengjiang, turning them inward and outward for nine times respectively, then perform point respiration (Fig. 118). Lower the hands to Dantian. 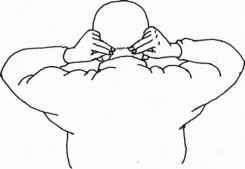 Then lift the hands to the hairline and rub the scalp from the anterior part to the posterior part, from the neck along the vagus nerve to the chin. Then lower the hands to Dantian. Repeat the movement nine times. At the ninth time when the hands lower to Dantian, perform "three times opening and closing and three times inhalation and exhalation." Then include the exercise. 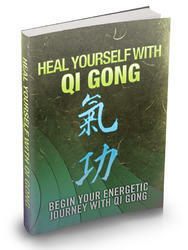 the heart and calming the mind as well as checking exuberant yang to easing mental strain can be achieved. This exercise can be used to treat dizziness, headaches, insomnia, tinnitus, nose diseases, eye diseases as well as apoplexy, facial paralysis, hemiplegia, disorders of stomach, proctoptosis and hematopathy. 2) Expectant Point Massage See Chapter Three for details.